Dealer in baseball and football sports tickets. All ticket prices are negotiable. 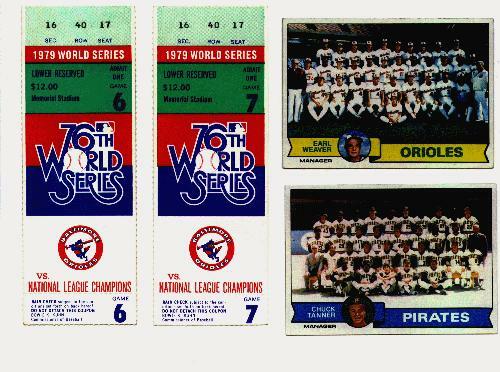 Both 1979 World Series ticket stubs plus the 1979 Topps team card (#689-Orioles and #244-Pirates). Tickets are marked Baltimore Orioles, Lower Reserved Sec. 16, Row 40, Seat 17 for Game 6 and Game 7. Makes a great Birthday gift for that Orioles or baseball fan. Get a game ticket for their favorite team from the day they were born. Comes unframed. 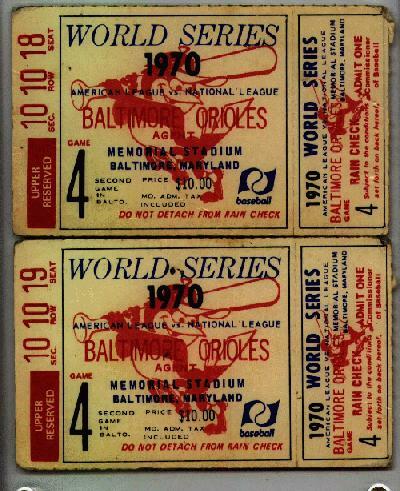 Regular Season Game Tickets from Baltimore Orioles from 1957, 1958, 1959, and 1960. Almost all the tickets are marked with date and scores on backs. Some tickets have complete box scores with attendance marked. Usual sports item. Receipt for Traffic Court of Baltimore City (4 pages) with game box scores and location where the person received the Traffic Court Summons. Three Redskin ticket schedules from 1982, 1983 and 1986 season. Two tickets against New York Giants. Seat number Sec 536 Row 14 seats 19 and 20. Dated 1 October 1967. Two set of tickets for Game 2 to Game 5. Seat number Sec 122 Row 07 seats 9 and 10. Dated 3 October, 17 October, 31 October, and 14 November 1982. Teams the Redskins played are Cleveland Browns , Pittsburgh Steelers, San Francisco 49ers, and Minnesota Vikings. Two set of tickets for Game 7. Seat number Sec 122 Row 07 seats 9 and 10. Dated 29 November 1987 against New York Giants. Two tickets for Game 6 and one ticket for Game 7. Seat number Sec 122 Row 07 seats 9 and 10. Dated 13 November 1988 against Chicago Bears and 27 November against Cleveland Browns. Two tickets for Game 6. Seat number Sec 122 Row 07 seats 9 and 10. Dated 10 November 1991 against Atlanta Falcons. Two tickets against Dallas Cowboys. Seat number Sec 122 Row 07 seats 11 and 12. Dated 13 December 1992.